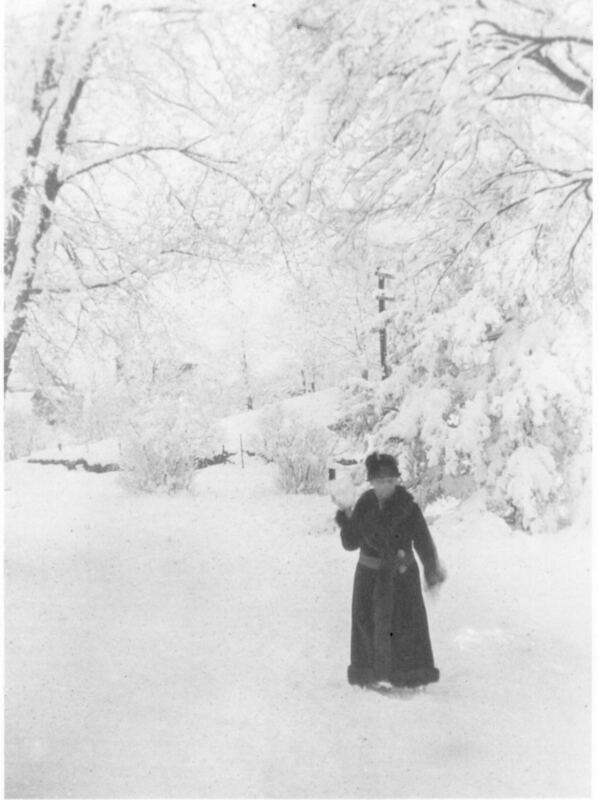 This picture shows Maud Green in the yard of the Ralph Green home in Dayton sometime in the first part of the 20th century. Snowstorms were a welcome occurrence in early Dayton as snow-packed roads were easier for sleighs than muddy, rutted roads were for wagons. However, the accompanying frigid weather made travel uncomfortable and hazardous. Last Sunday night and Monday saw some of the coldest weather of the season – the Mercury in Ottawa standing at about 20 below – thermometers vary more than watches. At Dayton they claim 26 below, and at Streator 24 at 8 o’clock. Anyhow it was cold. The week thereafter was milder. On Thursday for a few hours there was a driving snow storm, drifting badly, however. Ice cutting goes on for private houses, the crop now being some 20 inches thick, and of fine quality. Dayton, March 30. – The last great snow storm (Saturday, March 19,) has completely blockaded our roads, the lanes and some main roads being filled with snow, covering the fences in many places. By a six or seven miles circuitous our citizens have been enabled to drive from here to Ottawa. Our “oldest inhabitants” say it was the hardest storm for 25 years. It isn’t often we have five months of solid winter. Two months and a half of extremely cold weather and two and a half of deep snow. With farmers the spring work will come on all at once and farm laborers will be in active demand. Dayton, Feb. 16. – The river is clear of ice here – it went out last Saturday and Sunday, but as it formed a gorge near Howland’s place, the water is backed up quite high here. The heavy mush ice began running on Tuesday morning, and threatened a repetition of the great flood of last year. The lane leading into town from Ottawa has been full of snow and impassable until the recent thaw, when a road was broken through. It is almost impassable yet, however, and a number of tip overs were reported this week. Dayton people drive to Ottawa via Chas. Olmstead’s. Dayton, Ill., Feb. 7 – Another fine snow storm has commenced this morning which will make the sleighing still better. It has been excellent this winter, and during the past few weeks the weather has been warm enough to make sleighing thoroughly enjoyable. We have a very fine drive from here to Ottawa on the feeder, and as the ice is about 18 inches thick it is perfectly safe. The young people have been improving the times with sleighing parties in the surrounding neighborhood. They had a very enjoyable party a week or two ago at the large and commodious residence of Lew Robinson, Esq., in Rutland township, and last week they were entertained by Mr. and Mrs. H. B. Williams, of Ottawa.